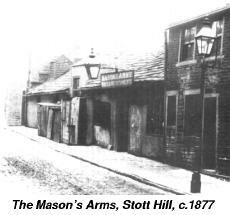 A hundred years ago the Masons Arms in Stott Hill closed its doors for the last time, to be demolished for street improvements. The photograph reproduced here, taken not long before the end, is a rare and evocative reminder of an institution which was so essential a feature of Victorian life, the public house. However, in his discussion of leisure pursuits in Bradford, David Russell noted, with considerable understatement: '… the social history of the public house is not yet fully explored'.1 This article forms part of a continuing endeavour to set matters right. 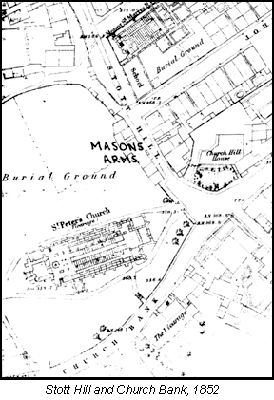 Using the Masons Arms as a case study, I shall attempt to throw some light on various aspects of what is proving to be an extensive and fascinating project: the history of the public house in 19th century Bradford. Robert Fearnley, one of the six children of Samuel and Elizabeth Fearnley, converted part of his property in Stott Hill into a beerhouse, in 1845.5 Elizabeth had inherited the property from her father, Robert Ward, who was the parish clerk. Her husband, Samuel, a stonemason, had built further houses on the land, making a total of eight and, on Elizabeth's death in 1835, the property was divided between her children.6 Robert followed his father's trade and continued to work as a stonemason after setting up the beerhouse, as the 1851 Census shows. The practice of following another occupation seems to have been quite common among beerhouse keepers. His wife, Hannah, probably played a major role in running the business, which would include brewing the beer. The name, Masons Arms, reflects not only Robert's trade, but that of several residents of the district, including other members of the Fearnley family. Within two years, in October 1866, the Priestleys sold the property for £985, to Anthony Mitchell, who had been the tenant since August 1865. Mitchell had been a brewer and ostler before taking the Masons Arms at the age of about 28, and his previous experience probably explains why he continued to brew his own beer when other landlords were obtaining their supplies from the growing number of common brewers in the area. In 1869, of the 255 beerhouses in the Bradford Soke (that is within two miles of the Queens Mill in Mill Bank, and in the Manor of Bradford), 106 were listed as being supplied by a specific brewery, and a further 53 as selling only, no supplier being mentioned.7 The beerhouse-brewer was nearing extinction, for in the entire Bradford Excise collection area in 1894,just four remained out of a total of 832.8 Like the Deightons before them, and in common with most beerhouse keepers, the Mitchells employed a servant, according to the Census of 1871 an 18-year-old woman. They also had a 'nurse', aged only 12, to look after their three young children. Mitchell describes himself solely as a publican, probably reflecting the enhanced standing of the business, since by this time he was permitted to sell wine (under legislation of 1860) and was also licensed for music. Mitchell died, aged only 36, in September 1874. His wife, Isabella, later married James Wooller, who joined her at the Masons Arms in February 1876. He left her, however, after three years, for in January 1879 she obtained an order of the Borough Court against him under the Divorce and Matrimonial Causes Act of 1857, to protect her earnings and property, since he had deserted her without cause. She was not left alone though, as the Census of 1881 reveals a sizeable household. There was Isabella herself, described as a publican; six children, only the eldest of whom, William, an accountant's apprentice, was employed; her mother; a lodger, and a servant, 17-year- old Mary Smith from Knaresborough. In the bar parlour, which was partitioned off, there was seating around the room and, in addition, eight stools, a form, five tables and nine spittoons. The walls were bare, apart from two pictures and a large mirror, but there were venetian blinds at the windows. The rooms were lit by gas. Although the parlour was usually the most comfortable room in a public house (the 'best room'), at the Masons Arms the tap room was similarly furnished. In addition to wall-seating there was a form and two tables. Seven pictures, a pair of buffalo horns and a dartboard adorned the walls, and in an age of clay pipes and cheap tobacco the tap room was supplied with twelve spittoons as a safeguard against 'random expectoration'. The Masons Arms was probably typical of the small beerhouse of its day, for as the clerk to the licensing justices later commented in his evidence to the Royal Commission on Liquor Licensing Laws, 'many of them were simply old cottages which never were fitted for the purpose of a public house of any kind'.15 The drinkers on Stott Hill were clearly not deterred by the hazard presented by the church's overcrowded burial ground, which had been repeatedly condemned as a danger to public health. The end of the Masons Arms was not the end of Isabella. In October 1892 she took over the Church Hill Tavern, where she remained until October 1909, but she had then given up brewing because, in July 1891, Tordoffs Brewery of Thornton Road became the owners.18 The Church Hill (after a period of confusion with Churchill, the man), perpetuates one former beerhouse, but a photograph is the only visible reminder of the Masons Arms.